OUTDOOR SUMMER CONCERTS IN THE QUEEN CITY | South Charlotte Newcomers! Charlotte’s beautiful weather beckons all to come outside and enjoy the sounds of summer! Along with the peaceful sounds of warm breezes swishing in the trees, crickets chirping and birds singing, the sound of music from outdoor summer concerts is a much anticipated Charlotte tradition! Blakeney is located in the newer, South Charlotte side of the Queen City. Families stroll from the many neighborhoods on Friday and Saturday nights to the Summer Concert Series at the Village Green in Blakeney Shopping Center. The free concerts are in a spacious patio and lawn area, perfect for families to enjoy a diverse selection of music. 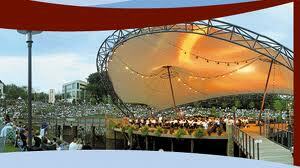 Pops in the Park offers outdoor performances by the terrific Charlotte Symphony Orchestra. The Orchestra performs at Symphony Park, located at the high-end Southpark Mall. Southpark is a well-established area with beautiful trees shading classic homes as well as newer, luxurious neighborhoods. Picnics are encouraged at Pops in the Park! Tickets can be purchased online. Stonecrest at Piper Glen is located in the popular Ballantyne area of Charlotte. Stonecrest offers free concerts every Friday and Saturday from 7-10pm. People can choose from the Plaza stage, located near Boneheads Seafood Restaurant, or the more spacious, kid-friendly fountain area located near Qdoba, Smashburger and the yummy ice cream from Marble Slab. Quail Corners is tucked in amongst the sociably warm neighborhoods of Park Road and the lush neighborhoods of Glen Eagles. The large, open patio area in Quail Corners is a great way to enjoy a great selection of music, from Rock to Country, Saturday’s, 7-10pm through September. The White Water Center is located just minutes from uptown Charlotte. The world’s largest man-made white water center offers outdoor water sports as well live, outdoor music in the summer. Riverjam offers an exciting variety of music Thursdays and Saturdays, 7-10pm. Charlotte’s fine weather is calling you to come outside and have some fun! Grab a picnic blanket, grab some friends and family, and enjoy the Sound of Music in the Queen City!